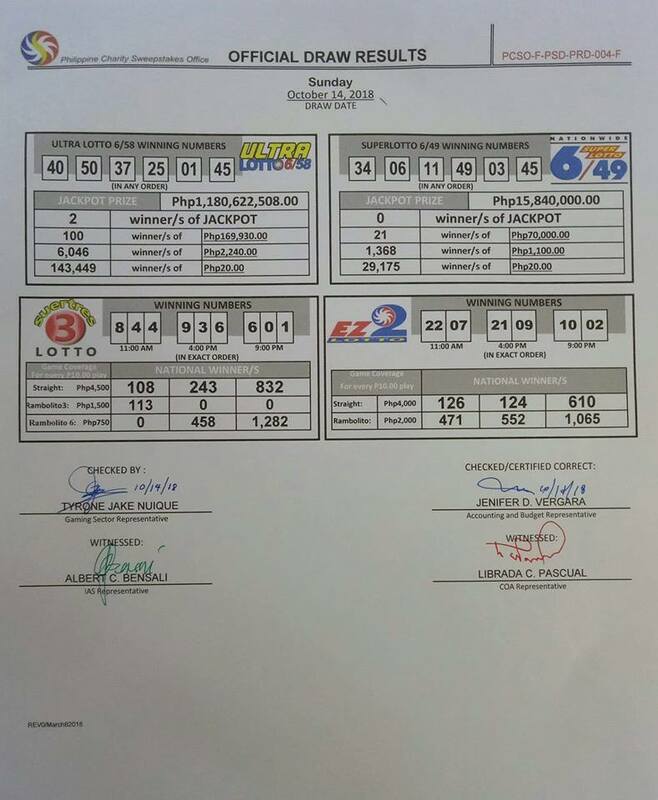 MANILA, Philippines - Two lucky bettors won the Php 1.18 billion jackpot prize in the Philippine Charity Sweepstakes Office (PCSO) Ultra Lotto 6/58 draw on Sunday, October 14, 2018. PCSO Ultra Lotto 6/58 October 14, 2018 Draw Summary. The money pot already reached Php 1,180,622,508.00, the highest in the history of Philippine lotto. The winning combination was 40-50-37-25-01-45. Winners will equally share the jackpot prize or equivalent to Php 590,311,254.00 each (minus 20% tax for lotto prize above P10,000). Apart from the two jackpot winners, 100 others won the consolation prize of P169,930.00 after they correctly guessed the five numbers from the winning combination.